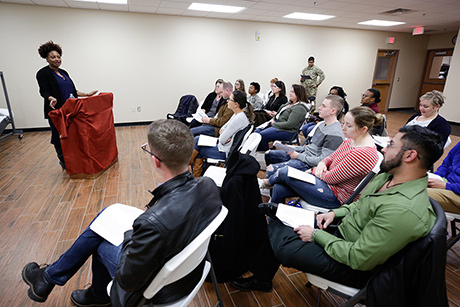 Tracy K. Smith conducts a reading and discussion with service members at Cannon Air Force Base near Clovis, New Mexico. January 11, 2018. Credit: Shawn Miller. From January 11-13, 2018, Poet Laureate Tracy K. Smith traveled to rural communities in New Mexico as a pilot for “American Conversations.” On this site you’ll find photos, audio, press, and reflections from her time on the road. To take a deeper dive into Tracy K. Smith’s visit to New Mexico, listen to “Making ‘American Conversations’: Part 1,” the first episode in a special three-part series of the Library of Congress’ “From the Catbird Seat” podcast that chronicles the origins of the poet laureate’s project. Tune in via our podcast page or your preferred podcast app. Thursday, January 11, 5:30 p.m.
Friday, January 12, 11:30 a.m.
Saturday, January 13, 11 a.m.